The Seahawks on Monday signed five players including former UW Husky Taniela Tupou. But none of the moves involved quarterbacks as Vernon Adams left town without signing a deal. In the wake of the rookie mini-camp over the weekend, the Seahawks made a handful of roster moves Monday, adding five players who took part on a tryout basis while releasing or waiving five others to make room on the 90-man roster. None of the moves involved quarterbacks, though, as it became official that the Seahawks did not sign Vernon Adams, the former Oregon and Eastern Washington standout who participated on a tryout basis. The Seahawks for now will remain with three quarterbacks on their 90-man roster — Russell Wilson, rookie Trevone Boykin of TCU and former Skyline star Jake Heaps, who was signed as a free agent a week ago Monday. The five players the Seahawks signed include former Husky defensive tackle Taniela Tupou, who is also a graduate of Archbishop Murphy High in Everett. Tupou, though, was signed as a fullback, the position he played the final two days of the mini-camp. He is currently the only player on the roster whose stated position is fullback as the Seahawks did not re-sign their two fullbacks of a year ago, Derrick Coleman and Will Tukafu. The other four players signed by the Seahawks were cornerback Jamal Marshall, linebacker Pete Robertson, tight end Ronnie Shields, wide receiver Tyler Slavin. Marshall, from North Texas, ended the min-camp with an interception of Boykin on Sunday. Shields and Slavin were each on Seattle’s 90-man roster earlier this year, then released last week, then took part in the camp on a tryout basis, and now re-signed. Robertson is a rookie from Texas Tech where he had 12 sacks last season. To make room on the roster the Seahawks released defensive tackle A.J. Francis, defensive tackle Lars Koht, safety Robert Smith, waived as injured wide receiver Jeff Fuller and cornerback Mohammed Seisay. Francis played in two games for the Seahawks late last season, making one tackle. Seisay was acquired from Detroit for a sixth-round pick last August, but then sat out the season on Injured Reserve after suffering a groin injury in the pre-season opener (Detroit used the pick to take defensive end Anthony Zettel of Penn State). Seisay played in 13 games for Detroit in 2014 and at 6-2, 202 pounds intrigued the Seahawks with his size. But the fact that he was waived as injured indicates he was still not able to get healthy — the Seahawks are entering the second week of phase two of their off-season program. Koht was signed last week as an undrafted free agent. Smith, a graduate of Clemson, had been signed earlier in the year as a free agent. Fuller, who played at Texas A&M, was signed earlier in the year after having played the last three seasons in the CFL with Calgary. The moves leave the Seahawks with 90 players, the NFL off-season maximum. Getting signed by the Seahawks continues what has been a pretty rapid turnaround in Tupou’s career the last few years. He was asked to transfer out of the UW program in 2013 by the staff of Steve Sarkisian after struggling to get on the field and live up to his billing as one of the top in-state recruits for the class of 2011. After deciding to stick it out, his play increased under the staff of Chris Petersen and he emerged as a team captain. The Seahawks grew more interested in the 6-1, 284-pound Tupou after watching his performance as a fullback at UW’s Pro Day, when he caught all 10 passes thrown his way from Heaps. Tupou also caught a touchdown pass on Sunday on a short toss from Boykin. After often having two fullbacks on their roster the last few years, the Seahawks appear to be exploring alternate ways of getting those roles filled. Third-round draft pick Nick Vannett is regarded as a good in-line blocker and could fill some H-back-type roles, for instance. 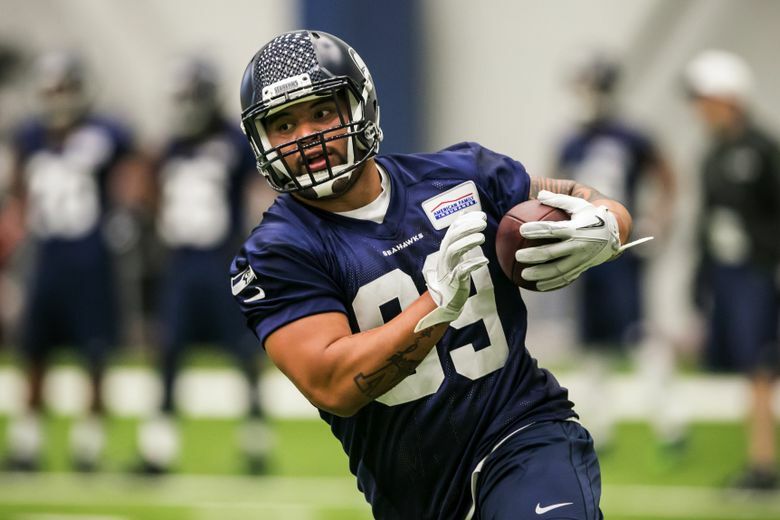 Seattle’s experimenting at that role now includes trying to convert Tupou, as well as potentially undrafted free agent signee Brandin Bryant, who was listed on the roster for the mini-camp as a fullback/defensive tackle. Bryant, though, played defense the final two days of the mini-camp while Tupou was on offense (roles that had been reversed on Friday).